Two years ago Pebble injected the idea of the smartwatch into the public consciousness; now they’re back with a totally updated model. Does the new Pebble have what it takes to compete in the smartwatch market it helped build? Their first watch was the Pebble (which we reviewed in 2013), followed by Pebble Steel (which was really more like Pebble 1.1 and not a total revision of the watch). The Pebble Time is definitely Pebble 2.0 and a complete overhaul of the Pebble from the design, to the screen, to the companion apps and app marketplace. Compared to the Pebble the Time has a host of improvements. The screen is 64-bit color instead of monochrome; while it’s no Retina display (and in fact the same resolution as the older Pebble watches) it is pleasant looking on account of a UI update and superior anti-aliasing. The case is more compact and the watch is lighter. The design is very understated (in a good way); where the original Pebble was a chunky glossy affair that definitely stood out the new Time just looks like a digital watch. We’re more than OK with the change. As much as we enjoy having conversations with strangers about smart watches, it’s nice to have a watch just look like a watch. The case is made out harder materials (glass with a coated-steel bezel) than the original Pebble (which had a polycarbonate unibody design). The charging port has been moved to the back of the case instead of the side (to support future “smart” straps with GPS modules, extra batteries, and other features). Currently there are no smartstraps to speak of, but if you search for DIY hacks more than a few intrepid hardware hackers have begun messing around with the port. Finally the Time includes a microphone for voice-based responses to notifications, text messages, emails, and so on. Currently this feature integrates very well with Android but is only available for Gmail for iOS on iOS devices. Inside the watch there is an accelerometer and compass; the accelerometer is used natively for determining your wrist position and lighting up the screen if you jiggle your wrist and by applications for fitness and sleep tracking. While on the subject of overhauled guts, the Pebble Time includes a Bluetooth upgrade that, unlike its predecessors, uses both regular and low-energy bluetooth for increased range and battery efficiency. The user interface is totally overhauled and significantly less clunky than the original Pebble UI. The Pebble OS is very snappy and responds instantly to button presses, loading new watchfaces, and load on-watch apps. 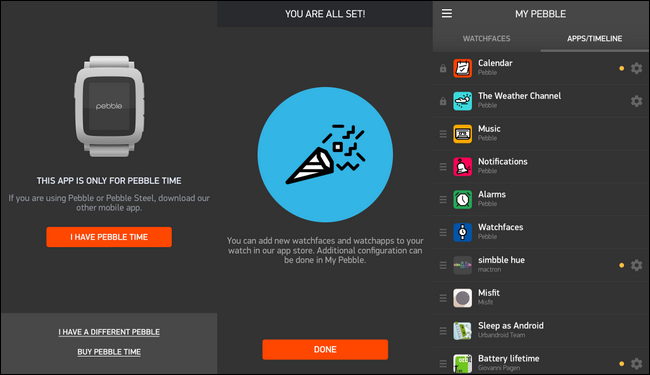 Speaking of watch apps, the Pebble Time comes with a brand new app store (which we’ll take a peek at in a moment) but also retroactively supports all the original Pebble apps; this means if you’ve, say, set up your Pebble to control your smarthome all those same apps work just fine on the Pebble Time. The Pebble Time retails for $199 and is, as of this review, available for preorder exclusively through Best Buy. Check out the Pebble website for purchase details. Setting up the Pebble Time was a much smoother affair that setting up our original Pebble in that there were no hiccups with device pairing. Although we did eventually get our original Pebble working just fine, there was a lot of “Are you there Pebble? It’s me, smartphone” back and forth. With the Time the watch paired instantly (with cute animations on the Time face to boot) and the application walked us through enabling all the necessary permissions on our iPhone so that we received notifications and such. The only real potential hiccup in the entire setup process is the dual Pebble apps in the app store. When Pebble overhauled their system for the TIme they also released a new mobile app to manage it. That’s great in that the new app is better, the Pebble appstore is more mature, and you’ll have an overall better user experience but it is a tiny bit confusing in that the old Pebble app is still in the appstores. (And, if you have both a Pebble and Pebble Time for side-by-side testing like we do in writing this article, you’ll actually need both of the unique apps installed side-by-side). Thankfully the apps are very clear in their naming and when you first launch them. When you run the Pebble Time app it prompts you immediately to confirm your watch is a Pebble Time and not a Pebble. Once things are linked the Pebble Time acts as a natural extension of your phone’s notification system as well as a mini platform for apps like fitness trackers, sleep trackers, timers, and even an odd game here and there. Speaking of such apps, let’s take a look at the app store. The real currency of the smartgadget age is apps: if your hardware is good enough but you don’t have apps for it then you’re out of luck. 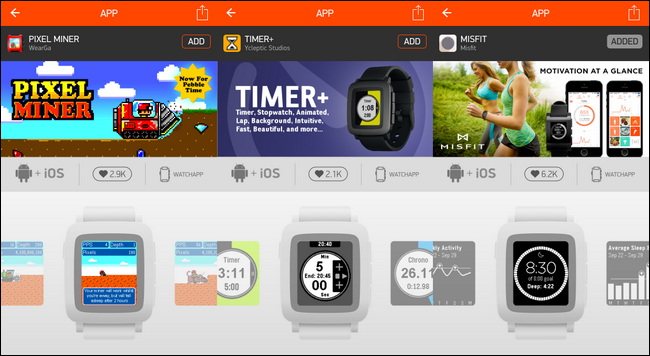 The Pebble Time app store is as limited as you’d expect the a niche market like a watch-specific appstore to be but that doesn’t mean it isn’t without some great apps. As we mentioned above the Pebble Time has access to not just the new colorful Time apps but also the original Pebble apps. Even better if you’re a Pebble to Pebble Time upgrader, it just imports all your old apps and watchfaces for you. It was nice to see all our home control apps, for example, right there in the applocker (no searching necessary). If you’re starting from scratch, however, it’s a snap to grab more apps by simply visiting the app store via the Pebble Time control app on your phone (found under Menu -> Get Apps). While you’re not going to find anything rivaling, say, the selection of apps in the Google Play Store, you will find a ton of both fun and practical apps: everything from silly novelties like the Pixel Minder on-watch minigame to useful little on-watch gadgets like timers and fitness trackers. After more than a month with the Pebble Time what do we have to say about it? Let’s take a look at the good, the bad, and the verdict. The Pebble Time is very light and slender (much smaller/lighter than the original Pebble and other watches currently on the market). 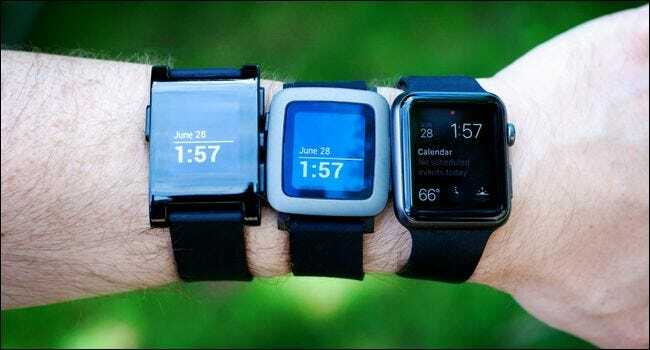 The only smartwatches on the market with equal battery life are the earlier versions of the Pebble. Timeline view is useful if you like keeping abreast of future calendar events/weather easily. Watch features standard 22mm watch straps; easy to change out for other straps including the cheap and ubiquitous NATA nylon watch straps. The Pebble OS is extremely snappy and responsive. Screen resolution significantly lower than competing watches like those from Samsung, Motorola, and Apple. Poor iOS integration that cripples the microphone feature. Lack of granular notification control. 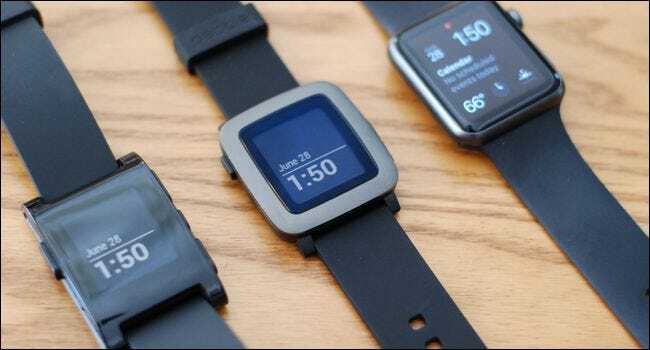 When we wrote our original review of the Pebble two years ago the Pebble was the best bet in the smartwatch market (we even sincerely titled our review “HTG Reviews the Pebble: The Best Bet in the Smartwatch Market“). We’ll always have a soft spot for the Pebble simply because, above all else, it really showed the world that smartwatches were feasible and, through an enormously successful Kickstarter campaign, that there were a lot of people who wanted a smartwatch. If the Pebble Time had come out last spring we’d have written a follow review most likely titled “HTG Reviews the Pebble Time: Still the Best Bet in the Smartwatch Market” but so much has changed in the intervening time that the Pebble Time is dropping into a very diverse smartwatch market that looks nothing like it did when the Pebble caused such a stir. A good microcosmic example of that change is the literal arrival times of our Pebble Time and Apple Watch. Our Kickstarter Pebble Time arrived a week after our pre-order Apple Watch. Comparing the Pebble Time to the Pebble is one thing; it’s a huge and marked improvement. Comparing the Pebble Time to the Apple Watch is another thing altogether, and it’s like comparing the smartphones of today to the early Windows and Palm smartphones of the mid-2000s. Despite the competition from slicker smartwatches like the Apple Watch the Pebble Time has stayed very true to the original mission of the Pebble both in premise and in our experience using it. While the Apple Watch is (and is slowly moving more toward) a wrist-based computer model the Pebble watches have never aspired to be yet another computer in your environment but a long-lived and subtle notification tool that extends the reach of your smartphone to your wrist. To that end the Pebble Time is pretty great. If your goal in purchasing a smartwatch is to snag a watch that is light, subtle in appearance, and gives you just enough information to keep you abreast of things without gluing yourself to a smartphone screen (or what amounts to a smartphone screen attached to your wrist) you really can’t do better at the moment than the Pebble Time; it’s priced just right at $199 for what it is (a supercharged update to the Pebble). 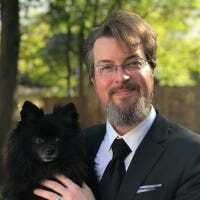 If you need more than that: more resolution, more power, better integration with iOS, and/or a more robust app store, then you need more than the Pebble.